Whether you’re doing a full remodel or a bathroom make over, there are things you can do to give your small bathroom the feeling of being larger. Some of these ideas do cost a little extra, so if you like them you’ll need to budget them into your project. By which I mean create a design that is uncluttered. Not as uncluttered as possible, but UNCLUTTERED! The bathroom in the picture does a good job of this. Notice that in the bathroom in the picture. the counter the sink sits on, the toilet, and the bidet all sit off the floor. Open floor space makes a room feel larger (it also makes it easier to clean). As much as I personally dislike small floor tiles (not sure why), when you use 3 inch tiles vs 12 inch tiles, the fact that there are more of them helps us feel the space goes farther. It’s an optical illusion, but it works. 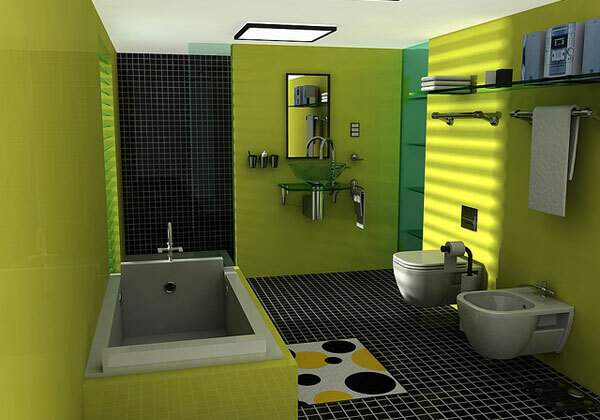 As you can see, this was not done in this bathroom, and the phrase is so over used it’s sometimes hard to know what people mean, but…… When the colors of your room mimics the colors of being outside, you feel that the space is larger. Seriously consider a dark floor (green or brown), lighter walls (light green or light blue), and a white ceiling. If you really want to go all out, install wall paper that looks like a meadow (seriously). This is also an optical illusion, and it’s a good one. The graphic below was provided to us by Tim Sparke of For Pumps which is near Sydney, Australia (which is why he spells color as colour). It’s so good I decided to display it here. Now that you’re ready to start your bathroom remodel, you should consider using one of our contractors. You’ll never find any better!